Nearly all across the board, summer is our shared season of entertainment and relaxation. And following the summer sun is almost always the summer fun – and this is your year to do it big, and do it right. So with the weather destined to be so warm and wonderful, taking a little time to remodel, revamp, and update your backyard, porch, or patio will set you up for many months of enjoyment this pool, party, and grilling season. All of the projects we’ve listed below can be completed in a single weekend – some even in a single day or single hour – and each one of them will make a huge difference in the ongoing feel of your home parties and stay-cations. So invest a little sweat now, and you’ll enjoy the fruits of your labor for a long time to come. Perhaps the easiest and most noticeable difference in making any backlot into a backyard paradise is how you choose to light it. Not only will lights literally brighten up the place, but they’ll make the whole area more inviting as the dusk turns to dark. But, regardless of which method you choose to use, you can always buy eco-friendly, cost-saving light-bulbs to set the tone of the area on the cheap. And, what’s better, you can even use smart fixtures and light-bulbs – which give you the ability to remotely control them with the help of your internet providers and smart home integration products – to always be a lighting wizard, even from afar. Alright, so this one may require you to tap into your carpentry and construction skills, but it’ll entirely change the feel of your back porch or patio. And old patio deck is a bad look, no matter where it exists. So, if the wood is starting to rot, it’s likely a good idea to rip it up and replace it, both for the sake of safety and in the name of vanity. Just be sure to buy some pre-treated lumber designed to survive outside. On the flipside, if your deck is still structurally sound, but looks like it’s lost a long battle with the weather, then it’s likely time to refresh it. Sand down the wood enough to get it back to the better and fresher wood beneath, and then refinish it with some durable, outdoor-grade polyurethane coating. So, rather than a wooden deck, let’s say you’ve got a solid, concrete patio laying the groundwork of your backyard. Why not give it a facelift with some color? Many folks leave their concrete slabs a drab grey for years and years, watching it slowly get more depressing with every passing one. 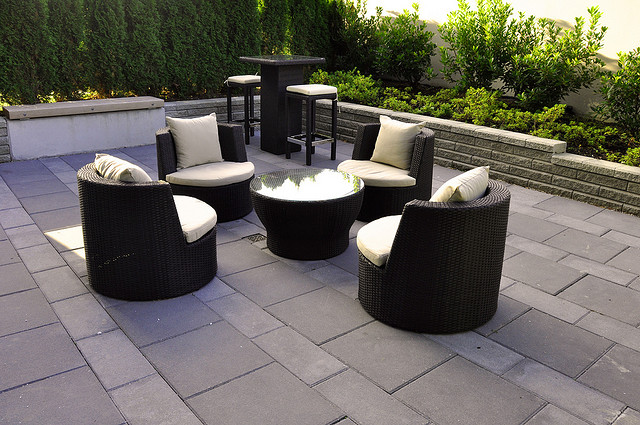 But there’s a cool thing called concrete paint designed just for this purpose – to put the pop back in your patio. This same idea of sprucing up an item, or an entire area, with a new coat of paint really does feel like magic the way it refreshes a room or a space, and it’s likely the cheapest way to do so as well. And you can apply it to the furniture, patio railing, and side of the house as well. Consider this: every time you’re at a party inside, somebody’s got the tunes playing and the music going to get everyone in the groove of having a good time, right? So, why should that stop when the party has migrated outside? It shouldn’t! Instead, install a weatherproof speaker system on your patio – perhaps even one complete with a HDTV – to keep your party guests entertained wherever they may roam. And if you’ve got WiFi setup, then you can keep the party going by playing DJ with only your thumbs and a smartphone. Alright, so this is where your personality has a chance to shine bright on through. Place some potted plants and flowers around, enough bamboo tiki torches to cover the yard and keep the bugs at bay, and any other decorations that you like to create the vibe and ambiance of a party or casual gathering you’d want to attend yourself. And remember those outdoor speakers you’d installed earlier? Yup, you should totally put those to good use right about now. While drinking, eating, and chatting are definitely wonderful human past times, sometimes you’ve got to give folks something else to do to break the ice, or to keep them coming back for more. At some level, we’re all still little kids on the inside, so having bocce ball, putt-putt, corn-hole toss, croquet, or some other easy and idle game arranged and available is a great way to kick things off and give folks a relaxed reason to interact. And, there’s a built-in benefit of all these games – they’re just as easy to pick up as they are to set up. The best part of all these small, home-improvement projects is that they’ll make you feel like you’ve gained so much from doing so little. And every time you’re sitting on your back porch enjoying the summer breeze from here on out, you’ll remember you’re old dim lighting, the drab concrete, the rotting wooden deck, and then relish in the moment of having made it better, and more enjoyable, with your own two hands. Justin Barisich is a freelancer, satirist, poet, and performer. He currently serves as a copywriter for Allconnect, helping folks get all their home utilities (like internet, TV, and electricity) setup as quickly and painlessly as possible. I love this post. The patio with 3 chairs in the middle of that beautiful backyard is my dream. When I was growing up my parents installed a very similar patio in their backyard and also had a pergola on top of it. They used to sit out there with company all the time. I am looking in to having something like this installed soon and I have contacted several companies to do the work.